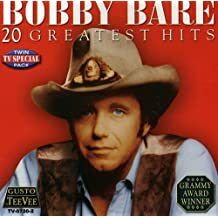 Bobby Bare lyrics are intended for your personal use only, he recorded everything from ballads to novelty songs and did them very well. Browse this site for a good selection of old timey country lyrics and chords. Bobby Bare was raised on a farm in Ohio and as a youngster wanted to be a singer. He loved writing songs as well and at an early age he landed a job at a local radio station. He later moved to California and impressed the folks at Capitol Records and was awarded a recording contract with them. Bobby was drafted into the service and that is when he wrote the huge hit "All American Boy" the parody of Elvis Presley going into the army. Bobby wrote songs for many artists and had singing hits of his own such as "Shame On Me", "I Wanna Go Home" and "Detroit City" to name a few. His novelty songs have always been very popular with his audiences. Although his record sales have fallen off he still has a loyal following and the respect of a new generation of country artists.